The Booker prizewinning novel was a theologically muddled curiosity with gory animal deaths that apparently upset its more mainstream readers, judging by the Amazon comments; part magical realist fable, part adventure story, part treatise on the mutability of faith. Books that are hard to film become a kind of holy grail to directors. This was in development for a decade, and it’s clear why -in addition to the difficulty of photographing a boy with a menagerie of animals in a tiny lifeboat, there was a far greater problem – but let’s get to that in a minute. First, it must be said that from a visual point of view this is a bar-raiser in every way – the best 3D I’ve seen apart from ‘Hugo’, the best melding of fantastical imagery yet, and a big screen view of the sea’s power that makes ‘Titanic’ look childish and prosaic. 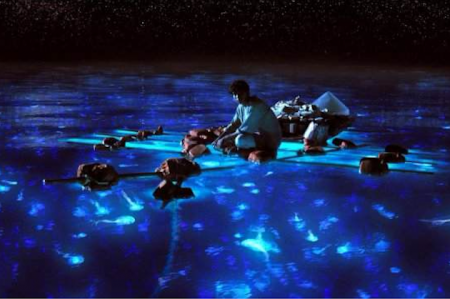 Director Ang Lee has never produced better work, and some of the visuals deserve framing, notably a bioluminescent whale, a reflection of the sky in a still sea, an image of the boy looking down through the water to an illuminated boat on the seabed – all are breath-catching. Supersmart Piscine Patel, named after a French swimming pool (the first in a series of overly quirky anecdotes that helped to set out the book’s stall as a Big Important Parable), seeks enlightenment, but his family leaves Pondicherry for a new life in Canada after his father sells their zoo. During the sea crossing, a storm capsizes the ship and Piscine finds himself stranded on a lifeboat with a starving Bengal tiger, a zebra, a hyena and a monkey, none of which is remotely anthropomorphic, mercifully. The animals are mostly CGI’d, but for once they have weight and heft in the way they move instead of the usual CGI weightlessness. That’s pretty much it for the story – and yet it isn’t. For what just about worked on the page if you were in a forgiving mood – a convoluted spiritual allegory – doesn’t quite work here, and is exposed in places as awkwardly twee cod-philosophy. What we accept as magical realism in literature is harder to swallow when it’s presented in solid visuals. So a visit to a cannibal island (the mongooses have been changed to meerkats) pushes the film into a strange alternative Disney universe, and a wraparound story section in a generic urban setting is boring. Most problematic is a long speech at the end in the latter explaining another interpretation of the story that will leave audiences scratching their heads. The question on everyone’s lips was ‘So – who was the tiger meant to be again?’ Without additional set-up scenes, the point of the symbolism gets rather lost. I had no idea who the tiger represented until I looked it up, and the film would have been better stripped of what is clearly a bit of writer-trying-to-be-faithful-to-source. As it stands, it’s the dazzling visual journey that enthrals, but if you think a little it retrospectively falls victim to the things it eschews. Those seeking enlightenment should sit back and enjoy the stunning images. It’s kid-friendly, too, and the little ones around me were entranced. Magical filmmaking from Lee, but some woolly thinking. Unfotunately that’s what I thought it would be like. Well, it leaves me more money for books. Next, B & M is in the bag on this side. I thought the book was confusing sounds like the movie might be more convoluted. When it was proposed for the Canadian one-book contest there was much debate about whether it even worked as a book. It sounded confusing even then. I liked most of the book. Especially the weird sequence that seems ripped out of the pages of early Dennis Wheatley — that part on the island with the strange plants. Much of the book is rip off apparently. Martel even admitted to having been “influenced” by a Brazilian writer’s novel about a similar shipwreck with animals. Others still say it’s all plagiarism.